The dynasty in boys basketball continues at Conant High. The Orioles beat Campbell 40-36 on Saturday afternoon to capture their second straight Division III title - they beat Campbell in the finals last year as well. Conant has now won 11 total champs as a program and 7 titles in the last 9 years - that folks is what you call a dynasty. "The biggest misconception is that it's easy for us to do this" said Eric Saucier, who has coached the Conant either as a head coach or assistant for each of their last 7 championships. "It takes a lot of hard work. Devin Springfield was a freshman when we won a championship with Sean Martin playing, so he saw what it takes to win a championship and how much work you have to put in. The cycle has repeated like that with the younger guys coming up learning from the varsity." The key to the win for Conant? One word - defense. Campbell was held to just 2 points in 2 different quarters in this game. The Cougars shot just 22% from the floor, and only scored 36 total points. "Coach Saucier's number one thing is defense" said Conant senior guard and tri-captain Robert O'Brien. "He says that if we hold them under 40 then we'll win." "No team in the playoffs scored 40 on us" Coach Saucier pointed out. "Defense wins championships." Conant geared their defense towards stopping Campbell junior Zach Bergeon, a likely first team all-state selection in D-III. "Zach scores half their points every game" said O'Brien. "So we focused on him and helped on the rest of them." Bergeon was still able to drop 18 points, but most 13 of them came at the foul line and he shot just 2/12 from the floor for the game. "Zach's a great basketball player" commented Campbell head coach John Langlois. "They tried to stop him. He had 5 guys on him." Conant started strong, going up 10-2 after 1 quarter of play. O'Brien made a steal and took it in for the easy fast break layup. Senior guard Nick Panagiotes (13 points) hit a 3-pointer, then senior forward Eli Hodgson hit an off balanced shot in the lane for a 7-0 Orioles lead. "We started slow against Berlin and Mascenic, so today we focused on getting off to a good start" said Hodgson. Hodgson made a nice block on Campbell freshman forward Harrison Vedrani, but then junior guard Andrew Smarse finally got the Cougars on the board with 1:30 left in the quarter on a pull-up jumper from the elbow. O'Brien got fouled on a 3-point attempt, but only made 1 of 3 shots. After scoring only 2 points in the 1st quarter Campbell went off for 17 in the 2nd to get back in the game. Panagiotes hit another 3 to make it 15-6 Conant, but then Campbell went on a 6-0 run. Kyle Shaw made a strong drive and lefty finish, and then Conant senior guard Kyle Carland picked up his 3rd foul and had to sit the rest of the half. Bergeon took the ball inside for 2, to cap the 6-0 run as the Cougars cut the Conant lead to 15-12. O'Brien hit a 3, but then Gray answered right back with 3 of his own. Soon Campbell had crept within 2 at 21-19, but that is the closest they would get for the rest of the game. O'Brien (14 points) connected on a baseline jumper at the buzzer, and it was 23-19 Conant at the half. The 3rd quarter was a very low scoring one, as Conant scored just 7 points and Campbell mustered just 2. 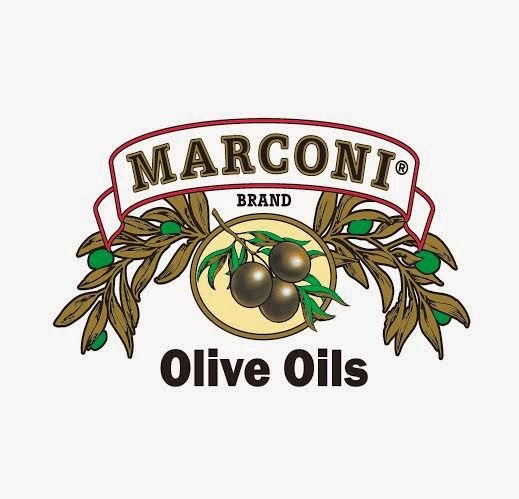 Panagiotes hit yet another 3-pointer in the beginning of the quarter to make it 28-19 Orioles. It was 30-21 Conant after 3. Hodgson banked in a runner (was a tough shot) Carland hit an 18-footer off a kick out by O'Brien and then it was Carland made a lefty finish in traffic. It seemed like the Orioles were pulling away, now up 36-27 with just 3:48 left in regulation. Give Campbell credit though, because they never stopped fighting out there. Vedrani scored a tough bucket inside, Bergeon drained a 3 and the Conant lead was down to 3, 39-36. "I am so proud of this team" said Coach Langlois. "We only have 3 kids who had varsity experience before this year and we have no seniors. Nobody ever quit and nobody hung their heads." Campbell gave them a late scare, but Conant was able to hang on for the 40-36 win. "Coach finally got us to play the type of defense he always wanted us to" said Hodgson with a smile. 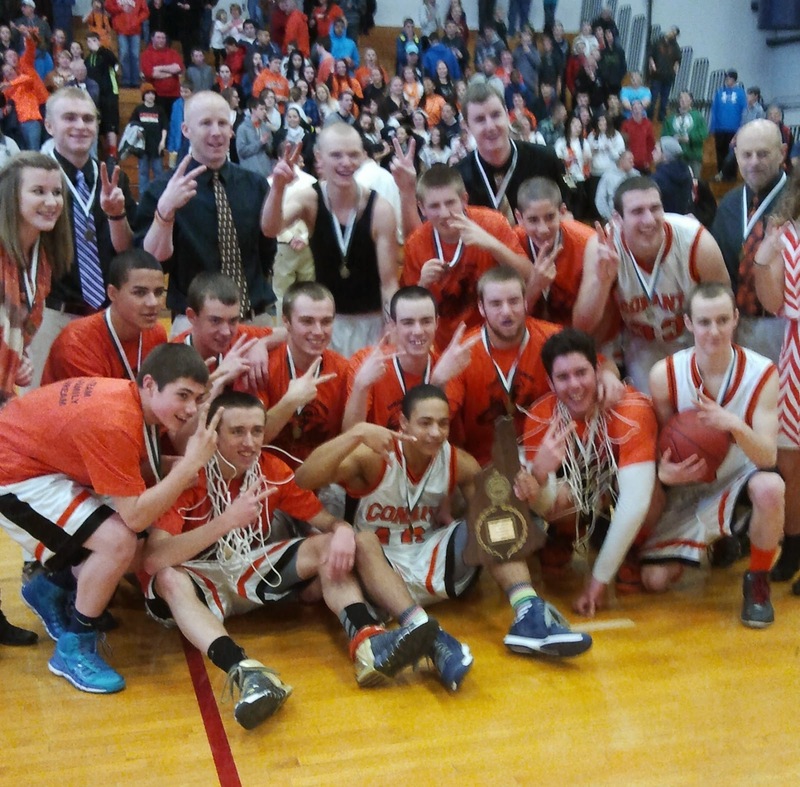 Another state championship for Conant, the best basketball program in New Hampshire. 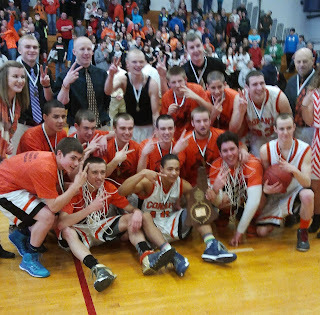 And as for Campbell, since they have no seniors you can expect them to be a title contender again next year. "Campbell will be the favorite next year" said Saucier. Now that the season is officially over this news can be made public. Conant senior guard Robert O'Brien will be attending Cushing Academy in Massachusetts to do a post-graduate year. Cushing is the same school where Kaleb Joseph (Nashua, NH) went to for the past 4 years. Joseph will be playing basketball at Syracuse University next year. Joseph was in attendance at Sunday's game. At 6-foot-2 O'Brien has a smooth shooting stroke from beyond the arc or mid-range, he's quick off the dribble and is cool under pressure. O'Brien has the ability to play either the 1 or the 2. His versatility and shooting prowess will help him at the next level. O'Brien now reclassifies to the Class of 2015. One of the region's top players from the Class of 2015 is the dynamic guard Jalen Adams, who O'Brien will be playing with next year at Cushing.